Does Beano Work? Our Findings Revealed | Does it Work? 4 consumer reviews - Write your own review now. The makers of Beano claim to be able to get rid of your unwanted flatulence and bloating. But is this really the case? We decided to put Beano to the test and find out whether it really does work. Read below to see what we discovered. Has Beano worked for you? Beano is a supplementary product that has been manufactured by Prestige Brands to in order to help prevent gas building up in the body. Containing a naturally sourced enzyme, this product works to ensure that your body begins to digest food properly, so that less gas is produced. In some cases, it may completely prevent gas from forming in the first place. Ideal for use when you know you’re going to eat foods that give you gas, it can be taken when you begin a meal or snack. Taking two to three tablets each time you eat, this product is ideal for anyone who likes to eat lots of vegetables, nuts, wholegrain foods, and seeds, but who wishes to prevent their consumption resulting in awkward gas. Flatulence and discomfort are signs that your body is not able to properly break down some of the the carbohydrates you eat, Beano however, can help to resolve this issue. Available in tablet form and convenient packets, you can also buy Beano Meltaways which melt on the tongue within moments. Those who also suffer from dairy intolerance may be interested to know that Beano + Dairy Defense can help to break down the complex sugars that often cause dairy intolerance. It works in conjunction with your digestive system to ensure that those stubborn carbohydrates are broken down quite effectively. This effectiveness will result in there being less gas in your colon, meaning you won’t feel as much discomfort as you may have otherwise. It’s thought that when taken at the start of a meal or snack, that it works very quickly. This is because it works in conjunction with the digestive system while you eat, so that less gas is produced. While many consumers may imagine it only works when beans are consumed, the fact is that it will work with other types of food too. Many of us experience flatulence and bloating upon eating specific types of foods, but a lot of us fail to do anything about it. Rather than avoiding the foods that you love to eat, taking just two to three tablets with your meal, means you’re less likely to feel uncomfortable. While some consumers are more than happy to swallow the tablets with their meal, others are quite happy to chew them instead. This is ideal for those who dislike swallowing tablets, and those who struggle to swallow too. Did you know that you can also crumble the tablets onto your food? Again, this is ideal for those who dislike swallowing tablets, but it also means that you know you can add them to your meal, without really noticing you’ve taken them. Swallowed, chewed, or crumbled, it will work quickly to deal with those issues of discomfort and embarrassment associated with the consumption of certain foods. Anyone above the age of 12 who has issues with gas and bloating may want to consider taking this remedy. Working to break down the carbohydrates that often cause gas, Beano is a completely natural supplement that is thought to work well. Anyone under the age of 12 who suffers from bloating and gas should speak to their pediatrician. Safe to use, and ideal for use with gas-producing meals in the home or in a restaurant, this product will relieve a lot of the discomfort associated with this digestive issue. Does Beano really stop gas? – Yes, it has been manufactured for this purpose, and works to prevent gas forming in the colon. 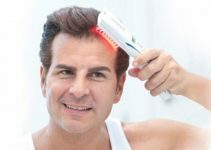 Studies have shown that it works for up to five hours in some users. Is it safe for pregnancy? – While it is thought to be perfectly safe for everyone to use, pregnant women should speak to their doctor first, as this product has not undergone any trials using pregnant women. Does it work for dogs? – No, it has only been made for human consumption. Please speak to your veterinarian about any concerns that you have with your dog(s). Does it work for milk? – Beano + Dairy Defense has been manufactured to help break down any lactose that is consumed. Is it ok for vegans? – This product is not thought to be suitable for vegans or vegetarians. Therefore vegans and vegetarians should consider using another product. What are the natural alternatives to Beano? – Fennel seeds, apple cider vinegar, peppermint, chamomile tea (Drunk after the meal), ginger, coriander, and cardamom can all be used as a natural alternative. Is it gluten-free? – Yes, but it should not be used as a supplement to break down any gluten that is consumed. Is is a laxative? – No. While this product does work to reduce the amount of flatulence that is formed in the colon, it does not work as a laxative. Is it probiotic? – No. This product is an enzyme that works to break down the carbohydrates that would otherwise cause gas. Where to buy? – It can be purchased directly from Amazon, RITE AID, drugstore, Walgreens, and Walmart. Prices may vary. The supplement can be purchased from Amazon for $4.64 for 30 tablets, as part of a monthly subscription service. If no subscription service is used, the cost rises to $4.88. Meltaways are also available from Amazon at a cost of $6.89-$7.03 for 15 strawberry flavor tablets. Beano + Dairy Defense can be purchased for $7.95 for 12 tablets, and 150 tablets of the original variety costs $10.58, whereas 100 are available for $16.15. These supplements are also sold on Amazon by third-party sellers, and prices may vary. It is also available from Walmart ranging from $4.88 for 30 tablets to $68.99 for 100. They work well – These anti gas pills are thought to work well, helping to prevent gas forming in the colon, and thereby reducing flatulence and bloating. Convenient packets – Available in convenient packets, they can be taken with you to restaurants, and used with your first bite of the meal. Helps to prevent embarrassment – Many people suffer from the embarrassment associated with gas and flatulence, fortunately this product can help to reduce the symptoms that people often do not wish to experience, especially in a public place. Ideal for those with dairy intolerance too – Those with dairy intolerance may benefit from using Beano + Dairy Defense, helping to reduce the symptoms associated with dairy intolerance, and gas. Side effects – Some of the possible side effects associated with taking this supplement can include: diarrhea, rashes, and cramping. You need to have them with you – Consumers need to make sure they have at least two Beano units with them, whenever they eat a meal or a snack that could produce gas. This isn’t always very convenient, and some users may forget to take them. Cheap, but not too cheap – While these supplements are not the most expensive on the market, consumers will need to keep buying them, so they can reap the benefits. Unfortunately over time, they may prove to be quite expensive. Some of the reviews that can be found on Amazon seem to reference effective results, including the lack of flatulence, and how well the tablets work with a variety of foods. When considering purchasing digestive aid, you may wish to keep these comments in mind. On the other hand, as is the case with many other supplements, the most common customer complaint about Beano seems related to its ingredients, specifically fish, and gluten. While this may not necessarily be what you’ll experience with it, these comments are something to keep in mind when you’re considering purchasing the product. It seems to be quite an effective gas-reducing product, that could help users feel less conscious after eating meals that usually result in flatulence and bloating. 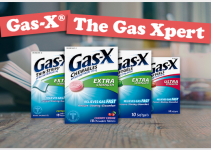 When take a look at Beano vs. Gas X, a similar product, we see that Beano appears to have longer lasting results for some consumers. Made to be eaten with the first bite of a meal, and with only a few side effects reported in some consumers, this product is thought to be one of the better ones on the market. Relatively low in price, and with a reasonably good reputation, it can help to make meal times a little less embarrassing, particularly if users are eating out. 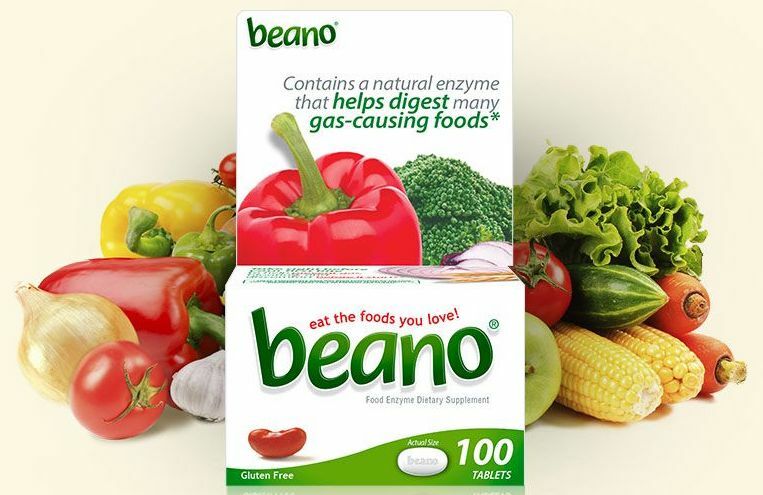 Easy to use, and with a choice of being able to swallow, chew, or sprinkle the tablets on food, Beano could help to reduce flatulence and bloating. Please let us know what you think about Beano, has it worked for you? Too expensive for what it is. The older version was much better! !